This entry was posted in Exploring Family and tagged brothers, family, FTSF, love, sibling rivalry, siblings by Nicki. Bookmark the permalink. Awww. I especially like the advice for Older Brothers and College Brothers. I didn’t have an older brother and I think that I always idealized what that relationship might be like in my mind. She seems equal parts exasperated and appreciative of them so I think she’s on the right track :). Oh Nicki!! This is adorable and priceless and so so perfect. I love it! And now, I must meet Sage in this life of mine here on the east coast. Wow, I LOVE this so much!!! My favorite is the advice for dealing with college brothers :). Maybe she could write a short column called “Sage Advice”. What an amazing picture too! Oooh I love the name of her column! You are very clever Peter ;). 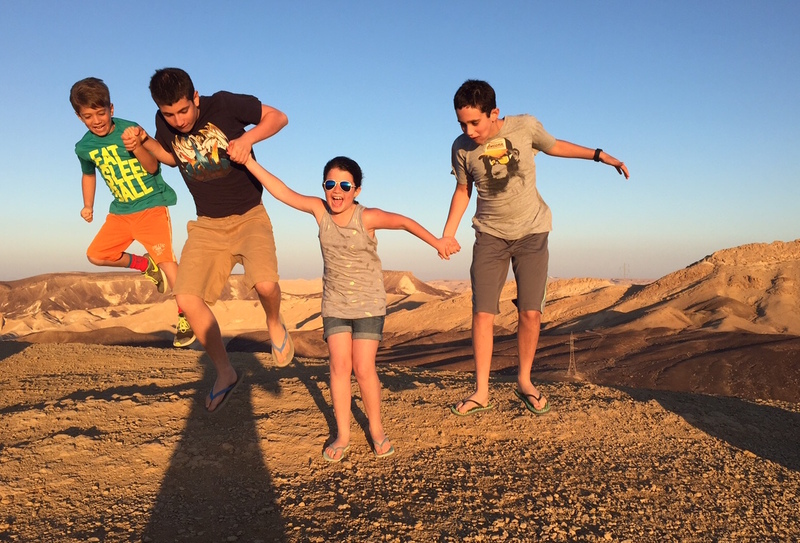 I took this pic in the crater in Mizpe Ramon – the best place to take control of ones brothers is in the desert! That’s one of my faves too, Anna :). So funny! Dang, she didn’t fall far from the smart, perceptive mama tree! Oh my gosh, I love this! How old is sage? My daughter is number three, out of four, only girl. She will love this. I’m printing it out to show her. Genius! She’s 9, Allie :). So curious what your daughter thinks and what she would add! Husbands, wives, spin instructors, doctors, teachers… The possibilities are really endless! Thanks so much for the great feedback and connection, Eli. These could be bigger than those Little Miss books back in the 70s and 80s! Thank you Mimi! That would be wonderful to get our families together :). And very annoying! She definitely has the little sister thing down pat :). Wow, I wish I could write as concisely and to the point as Sage. I’m 50 and my big brother is 60, but I’m totally going to try the tapping thing when I see him this weekend at a family wedding. Ha! Love to you and to Sage! This is so great I cannot even begin to articulate how much I love its greatness. I’m so happy to hear :). Thank you Mardra and thank you for sharing it, and for hosting FTSF! So sweet! She is a smart little girl!!!! What a great post! Sounds like she definitely has it all figured out on how to deal with brothers at all stages! Have an amazing week! This is priceless and sage, as in wise and the girl. 🙂 save this forever! I love it! Thank you Em and I will! I have the original safely in my treasure box :). Hi Nicki! Love this post, your girl is full of wisdom! I’d love to republish it on the site I edit, ForEveryMom, can you shoot me an email to discuss? Thanks so much!